As Buddhists we have to remember that while some of us may think our civil liberties and freedoms are being taken away, there are other people who think they are gaining freedoms and civil liberties. That some of these people were perhaps angry when the government of their choice was not in power. While we may have strong views about what is happening in the world, it does not make our view right, and many people may think our view is wrong and their view right. In the dharma we talk about having no view. As Buddhists we are interested in how we react to uncertain times, because we know that the rate of addiction, self harm and suicide can spike during a change of the status quo. Humans seem to have an inbuilt tendency to turn away from discomfort, and things we don’t like happening, with blame, denial, self pity and distraction. All of these coping mechanism just fuels more agitation and discontent in our heart/minds. I have no definitive answer of how to practise, but I do know that using uncertainty as an excuse to pick up our substance of distraction or choice will not make things better in the long term. While it may provide a temporary escape from the ills of the world, at some point we have to face our reality, no matter how painful we perceive it to be. Uncertain times, is an opportunity for us to cultivate self compassion. When we truly touch compassion in ourselves, we will touch the compassion of everybody else in the world. And when we step of our cushions into the world, whatever protest or march we choose to go on, we will be motivated from a place of loving kindness and compassion. As Buddhist cultivating self loving kindness and compassion is fundamental because it helps to purify the mind/heart, and free us from unwholesome thoughts about the people who are in political power and making decisions. The Dhamapada (verses of the dhamma) emphatically states: “hatred does not still hatred”. 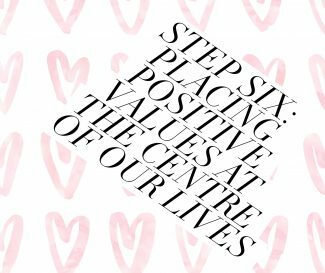 It’s during times like this we must remember step six: Placing Positive Values at the centre of our lives. A year ago on this blog, this stanza came to me while reflecting on the 6th step of the 8 step recovery program. Simply empowering. Usually, we are so trapped in our own stories that we forget that it is just mere stories and does not mean anything in the grander scheme of things. You can take a simple pause and feel your aliveness and realize that all these are just creations of the mind.